With a near monopoly of the topical sketch show market, NewsRevue is back playing sold out houses on the Fringe for an incredible 35th straight year. 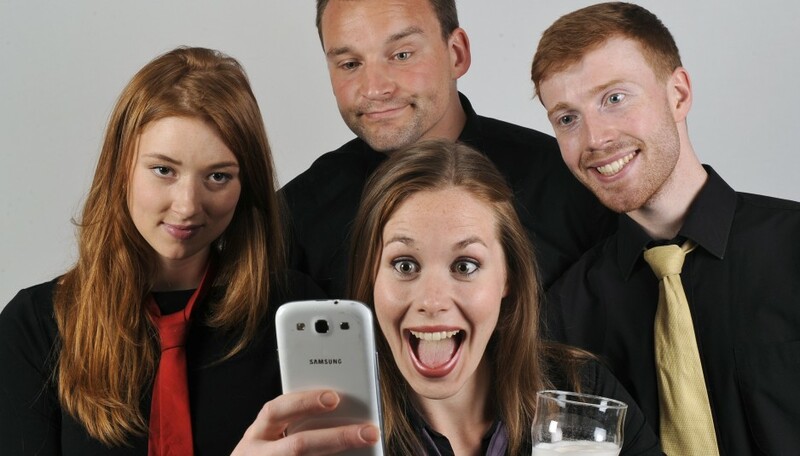 They’ve found the perfect format with quick fire sketches, musical parodies and one-liners. All performed by the super talented cast of Mimi Edwards, Matt Lee-Steer, Alice Marshall and Will Mulvey. Some of the best moments were the musical parodies and, with music featuring throughout, Musical Director Michael Riley, who also provides on-stage piano accompaniment, plays a major part in the show’s success. While politics naturally dominates and there are appearances by Cameron, Clegg, Farage, Johnson, Merkel, Salmond, Obama and Putin, other familiar faces crop up including Rebecca Brooks, Andy Murray, Gwyneth Paltrow and Oscar Pistorius. No punches are pulled, with the great and good held up to ridicule for our entertainment. All done in inimitable NewsRevue style, it’s great fun, hugely funny, and, occasionally, in brilliantly bad taste. The appreciative audience laughed from first to last. The writers deserve praise for finding a different angle on the year’s news and teasing out the laughs from some seemingly dire circumstances. By chance, the show marked the 35th anniversary of NewsRevue’s first appearance on the Fringe. In a nice touch, the audience were invited to join the NewsRevue team for a celebratory slice of cake after the show.